Double Your Arm Firepower With Superset Training! You know that someone made an impact on the field of their choice when people are studying your training methods and thought processes over three decades after you were active. Arnold Schwarzenegger is someone who obviously did just that. You know that someone made an impact on the field of their choice when people are studying your training methods and thought processes over three decades after you were active. Arnold Schwarzenegger is someone who obviously did just that. Arnold trained and competed from the early 1960's until 1975 and also came out of retirement once in 1980. One of the most popular aspects of Arnold's bodybuilding career that gets talked about is how he built his enormous biceps and triceps. Although he incorporated many tips and tricks over the years, two of his most successful strategies were visualization and supersets. He would visualize his biceps as mountains and with each rep they grew bigger and bigger. He also trained biceps and triceps back to back without rest so his pump would be even greater and his arms would grow that much more. I was no different than the millions of bodybuilding fans that studied all of Arnold's articles, videos, and books that covered all the ways he succeeded in the gym. When I first started training, I studied anything I could grab that had his name on it and implemented it immediately. As I grew and got stronger I added things into my own routine that I figured out on my own to make my biceps and triceps bigger and better. One thing I always had to keep in mind was that time was important. Although I wanted to make sure I fatigued the arms properly, I had to do it quickly because there was a lot going on in my day. I made it a point to do supersets so rest time was cut short. I also made sure I could perform the exercises in the same part of the gym so I wasn't wasting time going back and forth in the gym. That took time and allowed my muscles to rest which I didn't want. Another goal I had when I was training arms was I wanted to implement as many different ways to hit the biceps and triceps as possible. That meant using barbells, dumbbells and machines or cables every time I trained. They each had their advantages and if my arms were going to get big, I had to have as many advantages as possible. I started with barbells followed by dumbbells, and then finished up with cables or machines. I also wanted to mix up the rep ranges so my muscles wouldn't adapt. 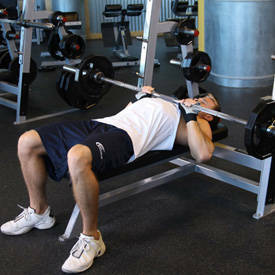 I would go as low as 6 and as many as 25 reps throughout the workout. Before you begin, make sure you warm up properly by doing some light cardio for about ten minutes to get your body warm and ready to go. Also do some curls with light dumbbells and push-ups to make sure you are ready to go. When it comes to packing on size and gaining strength in the arms nothing beats barbell curls and close grip bench presses. Since these were what I started with and both arms were working together also, this meant I could use more weight. I wanted to hit them heavy starting out so I did four supersets of six reps for each. I would place a barbell in front of the bench and use it for the curls followed by lying back on the bench and using a second barbell for the close-grip presses. I felt my biceps were weaker so I started with the curls when I was fresh. 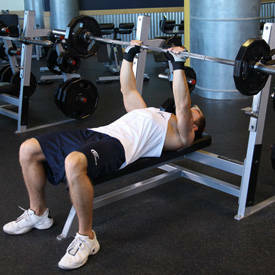 If you feel your triceps are weaker you should start with the presses. I would rest for 90 seconds in between each superset so I had ample time to recover yet also stay warm. I knew from all the studying I had done that using dumbbells stimulated and isolated the muscles better so I incorporated those second. Something else I did on my own was alternate which muscle I started with on each group of supersets. Since I started with biceps with the first group of exercises I started with triceps this time. I would place two sets of dumbbells with me at my bench so no one would take them when I needed them. I started with the lying dumbbell extensions and as soon as I was finished I stood up and used the other dumbbells for my hammer curls. I preferred hammers because it hit the biceps from a different angle than the barbell curls. For this group of exercises I wanted to lift heavy, but knowing I had already went through the first superset, was concerned about cheating so I went with four sets of 10 reps on this group. However to keep the intensity high I cut my rest time in between supersets from 90 seconds to 60. It is at this point I felt my pump grow the most. At this point I want to finish this workout off right and leave the gym with people staring at me in disbelief. I want my pump to be as big as possible. This is when I add in the cables to my superset routine. With cables, there is less chance of injury which was great after all the weight I had just lifted and I could isolate the muscles even better than with the dumbbells. I would go with the angled bar attachment for the cable curls and the rope for the pressdowns. The best part of this superset was I could turn around and be right at the next station so there was virtually no time to rest in between the two exercises. Since I started with the tris on the last group, I start with bis once again this time. Because of the fact I want to lock that pump in so it stays with me long after I leave the gym, I do three things. I do slow negatives, I also go up to 25 reps for each movement, and finally, since I need to be out of the gym soon, I only rest for 30 seconds in between supersets. That means catch your breath, sip some water, and go. Four rounds on this group ensure that the arms are jacked and you know beyond a shadow of a doubt you trained as hard as possible for that day. Here is one more look at this superset routine to make your arms huge! Start with the muscle group you feel is weaker on the first group. Start with the other muscle group on the second group and then start with the same muscle group you did first on the final group. When you go to do the workout again, go the opposite way. Switch it up the next time so it is like this. Give this program a try once a week for eight weeks and watch your arms grow to new levels of muscularity you didn't think was possible for yourself. Remember to visualize your arms growing like mountains just like Arnold did.